Ralph Jacob Capaul, 88 – Passed away Sunday evening (February 3, 2019) at his daughter’s home near Prichard after recovering from a fall and a bout with pneumonia. Born February 26, 1930 to George and Frances (Patchen) Capaul in Coeur d’Alene, he was a lifelong resident of Coeur d’Alene who enjoyed family, fishing, hunting, good Dean Martin music (never Willie Nelson), and working with good people. While still in high school, he joined the Idaho National Guard and was later attached to the 937th Field Artillery. In 1951 he married Irene Lois Asbury prior to deploying to Korea where he served as a 23 year old E-8 M.Sgt. in charge of “C” Battery of the 937th “Arkansas Long Toms” from 1951 to early 1953 seeing action in many places in what is now North and South Korea. He was awarded the Bronze Star for his actions and spoke solemnly about his time there. He came to hate war and the waste of these conflicts but told many good stories of the brave soldiers he served with. Following discharge from Korea, he worked at Leland Trailers in Spokane and later went to work for the Idaho Water Co. as a ditch digger during a time when backhoe tractors were expensive and only used on “big jobs”. He eventually became a full-time employee and went on to become foreman and superintendent. The water company was his life and he dedicated himself to the job. Idaho Water sold the system and Tubbs Hill to the City of Coeur d’Alene in 1975. Ralph chose to stay on with the City for another 18 years as Superintendent working to upgrade the City’s Water System which still contained many sections of wooden pipe. As fishing and hunting became too much of a physical challenge in his later life he enjoyed reading and taking a little money away from the local casinos. 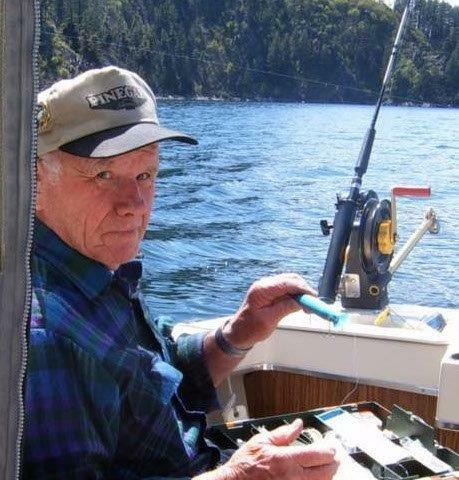 He enjoyed many trips with his brother Ray and his wife Betty or his neighbor buddy Gary. Ralph was preceded in death by his wife Irene, his parents, his eldest brother George M., brother Alan, and younger brother Ray, sister Ellene (Scott) of Missouri, and daughter-in-law Nancy Maryott Capaul. He and Irene had 3 children, Lewis (Nancy) of Rathdrum, William (Marianne) of Coeur d’Alene, and Brenda (Frank) Gabriel of Prichard. He is also survived by six grandsons Tom (Jennifer - Cheney), Cameron (Spokane), Jason (Seattle), Jacob (Katelyn - Cd’A), Braden (Cd’A), and W. Cody (Shannel) of Post Falls. Ralph was very proud of his 6 great grandchildren and always said grandchildren provided so much enjoyment that he should have had them first. In his later years after the passing of Irene, Ralph lived alone but had great neighbors. The family would like to express their deepest love and appreciation to Gary and Debbie Essman who not only were great neighbors, they were often first responders after a fall or illness. Gary also kept the driveway and walks clear, made daily mail deliveries, and became a close casino buddy often competing in who won and who lost. A Memorial Service will be held at Trinity Lutheran Church, 812 N 5th, in Coeur d’Alene at 1:00 pm, Saturday, February 23, 2019. In lieu of flowers, Ralph would appreciate contributions in his memory to the Museum of North Idaho and Newby-ginnings of North Idaho, Inc.